Mr. Hsin is a popular teacher of science to ESOL students. How many teachers really enjoy teaching ESOL students? Mr. Lawrence Hsin is one teacher who loves teaching ESOL students in the school. 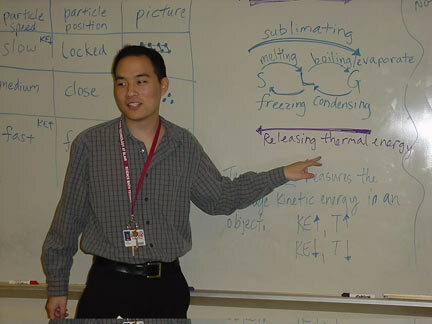 Mr. Lawrence Hsin is a teacher of science to ESOL students at Montgomery Blair High School. He has been teaching science at Blair for three years. This year he is teaching Matter & Energy to ESOL students only and Connections to other students. Before he graduated from school, he wanted to be a teacher for ESOL students. Since his parents are immigrants, he was very interested in teaching and being thankful for what immigrants bring in to this country. There are a lot of values in diverse and cultures in the world. Mr. Hsin really enjoys teaching ESOL students because he likes interacting with people from different cultures and backgrounds. Mr. Hsin spends a lot time to prepare for his ESOL class because he wants his students to feel very comfortable in the class. “To prepare for ESOL Matter and Energy class, I use textbooks and notes. I also use lessons from previous years and try to make them better by seeing what worked and what didn’t work. I also plan lessons with other teachers who also teach Matter and Energy,” he said. According to Mr. Hsin’s students, he has many qualities that can describe his personality. Mona Boursiquot was one of Mr. Hsin’s student last year. “He is a very helpful teacher, very patient and kind. He understands his students’ needs and takes his time to help them out,” she said. Long Nguyen is a junior and had Mr. Hsin in 2004. “He is gentle, unbeatable and the kindest teacher,” he said. Yani also had Mr. Hsin in 2004 and she is a sophomore. “He is friendly, helpful and impartial,” she said. Teachers should help students outside of class. Mr. Hsin is not an exception, and he offers help to students everyday at lunch and after school. Helen Alemu is a senior and had him two years ago. “He [helps us] make-up late work and he explains things that I didn’t understand,” she said. Mr. Hsin also prefers asking students to come for help since he knows some students need more support. How many students need support from Mr. Hsin out of the class? Not as many as someone might think. “I never got help after his class because he teaches the class well,” Long said. “No, Mr. Hsin didn’t help me during lunch or after school because I never needed extra help,” Mona said. Mr. Hsin also helps the students who get into problems. He listens to their problems and he tries to help them to solve it. Long told about one time when he had a personality problem with his friend and cried in the class. “He does care about students, so he asked me softly and individually, and said [he would] help me to solve it after school,” Long said. Mr. Hsin felt that Long needed a person to listen to his problem and give him some options to solve them. “Every day is different, and I like how my students are willing to laugh and have a good time while learning,” Mr. Hsin said. “I also like being around students who are learning English, since I am bilingual myself,” Mr. Hsin added. Besides English, he also speaks Chinese and Spanish. Mr. Hsin learned Spanish in high school and practices it now when he talks to parents. He finds out that there are a lot of parents who don’t speak English, so he has to use his Spanish with them. His “mother tongue” is Mandarin. He learned Mandarin at home since his parents are Chinese who speak Mandarin. Students in Mr. Hsin’s class love him as part of their family,” I feel like home. He is like my big brother. But I really respect him as my teacher,” Long said.